As the final two days of racing played out, four of the 17 teams battling for the 2015 Rolex Farr 40 World Championship title in Long Beach, California, were in contention to win the championship. The top two teams – tied on points going into the last day – had only an eight-point cushion to the fourth-place boat, setting the stage for a thrilling conclusion to the 18th edition of the class’ world championship. Rolex Farr 40 World Championship - Naples Island, known as the “Venice of America,” is home to Long Beach Yacht Club, which hosted 17 international teams vying for the 2015 Rolex Farr 40 World Championship title (September 24-27). ORACLE TEAM USA returns to the waters of Bermuda with a renewed, revamped, relaunched AC45F test boat. Boat two is due before the end of the month. The best base kitchen in Bermuda - published on Sep 24, 2015 - The canteen container at the ORACLE TEAM USA base in Dockyard is a hit with team members, who enjoy breakfast and lunch, as well as the occasional special occasional BBQ, at one of Bermuda's most tasty kitchens. Maxi Yacht Rolex Cup 2015 - video highlights above - A fleet of 40 of the world’s most spectacular monohull yachts gathered in Porto Cervo, Sardinia, for Race 1 of the Maxi Yacht Rolex Cup, on Monday, September 7th. With the yachts ranging from 60 ft up to almost 220 ft, the ruggedly beautiful coast of Northern Sardinia provided a breathtaking backdrop to the six-day regatta, impeccably hosted by the Yacht Club Costa Smeralda, partners with Rolex for over 30 years. One of the most competitive battles took place between the six 72-footers entered for the Rolex Maxi 72 World Championship. Maxi owners have little trouble convincing the world’s best professional sailors - Olympic Champions, round-the-world race and America’s Cup winners - to join them for one of the most highly anticipated contests in the annual grand prix sailing calendar. Published on Sep 21, 2015. Spirit of Yachting - Rolex Farr 40 World Championship 2014: The year 2014 heralded the 17th edition of the Rolex Farr 40 World Championship, a competition that has captivated the sailing community since its inception in 1998. A defining juncture for the Farr 40 racing season, the Championship offers the perfect stage for evenly-matched, 40-foot monohull racing boats, helmed by skilled and competitive owners. Fiercely contested, the event demands and rewards precise teamwork, consistency and determination. These attributes, together with the true sporting nature of the competition, align perfectly with the core values of Rolex, title sponsor of the event since 2001. The reward for victory is coveted throughout the sailing world: the Rolex Farr 40 World Championship trophy and a Rolex timepiece, true recognition for greatness on the water. Long Beach Yacht Club: "In life, timing is everything. And, after seven years in the Farr 40 class, the timing was right for New York financier Alex Roepers to achieve a long-held goal of winning the Rolex Farr 40 World Championship. Roepers will have his chance to defend his title – a feat which has not been accomplished since 2006 when Vincenzo Onorato won again in ’07 and ‘08 aboard his Italian-flagged Mascalzone Latino – on September 24 - 27 when the 2015 Rolex Farr 40 World Championship begins at Long Beach Yacht Club... Long Beach Yacht Club is located on the Southeast Corner of Naples Island on Alamitos Bay, adjacent to Basin 4 of the Alamitos Bay Marina. Committees organize and manage a full schedule of yachting, educational, social and public-outreach programs, and the Club is recognized throughout the worldwide yachting community for its hospitality." Highlights from day 4 of the 2015 New York Yacht Club Invitational Cup. This video features exclusive aerial, on-the-water, and on-board footage from this premiere racing event. What a day for Team New York Yacht Club as they had a 2nd and two 4ths on the penult day of the 2015 New York Yacht Club Invitational Cup. The conditions sent the teams up the Bay so the conditions were quite different than the last few days and included a narrow course, an ebbing tide, and dying breeze. and at Invitational Cup: "The Rolex New York Yacht Club Invitational Cup is hosted by the NYYC in Newport, Rhode Island in September at its Harbour Court Clubhouse. The fourth biennial Invitational Cup will be held September 12 to 19, 2015." Current and breeze put Qingdao Sailors to the test : News | ISAF Sailing World Cup | Official Site: "Qingdao's testing current and variable breeze put the 320 sailors from 32 nations racing across nine classes to the test on the second day of competition...."
The winners hoist their trophies high and their Rolex Time pieces even higher. Congratulations to the St. Francis Yacht Club on 50 years. Here's to 50 more! Rolex Big Boat Series: "Fifty-one years is a long time for any event to sustain its allure, and judging by the larger-than-usual list of early entries, the 2015 Rolex Big Boat Series (RBBS) is on course for another fantastic year of racing..."
"The Beat" - Episode 8: San Francisco Thrill Ride - Published on Sep 15, 2015 - In this week's episode of "The Beat", Katy Nastro takes us to San Francisco as we highlight the unique and exciting Ronstan Bridge to Bridge Race and 18-Foot Skiff International Regatta, hosted by St. Francis Yacht Club. The spectacular on-board and aerial footage captures the speed and skill involved in these fascinating races with the majestic San Francisco Bay as the perfect venue. More info: "The Beat" at http://www.ussailingthebeat.com/. "The Beat" - Episode 7: CRAB - Published on Aug 31, 2015: In this week's episode of "The Beat", Katy Nastro takes us to Annapolis, Maryland as we highlight Chesapeake Region Accessible Boating (CRAB). CRAB's mission is to make the therapeutic benefits of sailing and the freedom it provides a reality for physically and/or developmentally-challenged individuals and their families regardless of their financial circumstances. We will also check-out the Boatyard Bar & Grill Regatta fundraiser, hosted by the Eastport Yacht Club. All 17 teams headed offshore on Sunday Sept 13 for the first day of official practice of the 2015 Rolex Invitational Cup. On board with Team New York Yacht Club, the team showed that they are working hard to together, bringing their winning precision and perfection to the water to grab the event's prestigious trophy. 2015 Invitational Cup: "September 12-19, 2015 Newport, Rhode Island - The Rolex New York Yacht Club Invitational Cup is a biennial event hosted by the NYYC in Newport, Rhode Island in September at its Harbour Court Clubhouse. The Invitational Cup is a regatta for yacht clubs from around the world and their sailors. It has become an important Corinthian (amateur) sailing competition. The racing is in NYYC Swan 42s – the eighth one-design class created by the New York Yacht Club since 1900. Seventeen teams from 11 countries and five continents will be competing in the 2015 Rolex New York Yacht Club Invitational Cup. Among the returning teams are Royal Cork Yacht Club, the Royal Yacht Squadron, Royal Hong Kong Yacht Club, Japan Sailing Federation, Royal Canadian Yacht Club, Real Club Náutico de Barcelona and the host team from the New York Yacht Club, all of which have competed in each edition of the Rolex NYYC Invitational Cup." ISAF Sailing World Cup Qingdao "More than 240 sailors from 37 nations will be in Qingdao, China from 14 – 20 September 2015 for the next ISAF Sailing World Cup installment." Maxi Yacht Rolex Cup: "September 12, 2015 The Maxi Yacht Rolex Cup saved the best for last with a gloriously sunny, windy day on the Costa Smeralda. The 19-knot breezes provided a thrilling finale to the 26th edition of a spectacular regatta that is the cornerstone of a longstanding partnership between Rolex and the Yacht Club Costa Smeralda (YCCS). Bella Mente: In fine spirit In the Rolex Maxi 72 World Championship, owner Hap Fauth steered Bella Mente to victory, reclaiming the title he last held in 2012...."
Maxi Yacht Rolex Cup: "Comanche is on a globe-trotting quest to prove that she is the world’s most powerful and technically advanced monohull of the modern era. There are few better ways to validate that claim than to compete in three of the most prestigious Rolex sponsored events in her first year on the water. At the Maxi Yacht Rolex Cup for the first time, for sheer speed there is no other boat that can touch Jim Clark and Kristy Hinze Clark’s 100-footer. Yet there are still very good reasons for this state-of-the-art yacht being here in Porto Cervo, as skipper Ken Read explained: “The priority for the boat is to take part in every great offshore race on the calendar. So far we've done a Rolex Sydney Hobart Race, we've raced across the Atlantic, and we've done a Rolex Fastnet Race.” It has been an incredible start for a yacht that was only launched at the end of 2014, withComanche establishing her credentials as the fastest offshore monohull in the world with a searing pace across the Atlantic in July, quickly followed by line honours victory at the Rolex Fastnet Race in August." Ex-America's Cup sailor sues ISAF, jury over penalty: "Former America's Cup sailor Matt Mitchell is suing the International Sailing Federation and its five-member international jury in federal court, asking that his penalty from the 2013 regatta be vacated..."
The #RaceToBermuda is on! -Published on Sep 4, 2015: Bermuda's Minister for Economic Development, the Honorable Grant Gibbons, and ORACLE TEAM USA skipper Jimmy Spithill invite you to Bermuda for the Louis Vuitton America's Cup World Series with racing on October 17-18. And if you're already in Bermuda - even better! Make sure you come down to the Event Village on Front Street or get out on the water to follow all the action. How to fly an America's Cup AC45f foiling catamaran - How do you fly an AC45F? As the Portsmouth AC World Series event approaches, Land Rover BAR's Paul Campbell-James explains to Matthew Sheahan how crews fly their foiling 45 foot cats. The MIT Sailing Pavilion, the first facility constructed for college sailing, was built in 1936. It is now known as the birthplace of today's collegiate sailing. The first ten Dinghy Championships of the newly organized Intercollegiate Yacht Racing Association (ICYRA) were sailed on the Charles River in MIT's fleet of cat-rigged, wooden Tech Dinghies. To this day, MIT continues to host more college regattas than any other site in the country. UPDATE September 7, 2015: Sailing Comanche, the world's fastest monohull - Sailing the world's fastest monohull the 100ft carbon supermaxi Comanche. Matthew Sheahan gets aboard and talks to skipper Ken Read about what makes this boat special. 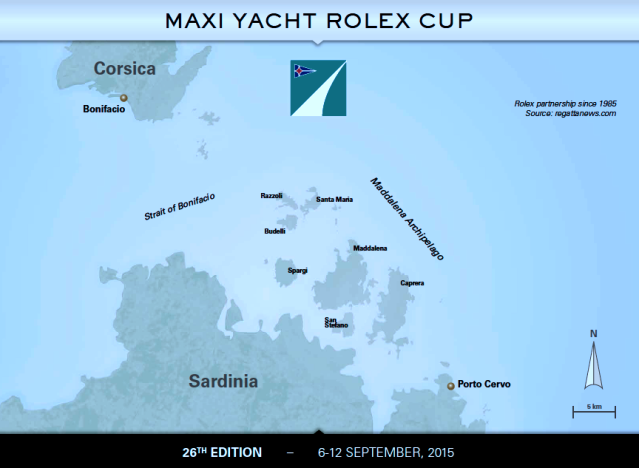 Comanche RESULTS at Maxi Yacht Rolex Cup, Porto Cervo, Sardinia, Sept. 6-12. Spirit of Yachting - Maxi Yacht Rolex Cup 2014 video above - In the crystal clear waters of Porto Cervo, Sardinia, the 2014 Maxi Yacht Rolex Cup took place for the fifth time. Against the breath-taking setting of Italy’s Mediterranean coast, passionate boat owners on board their cutting-edge Maxi yachts embarked on an adventure of intense rivalry and high drama. The focus was on sailing in style and even included a behind-the-scenes look at the making of the renowned Swan yachts, with a tour at the emblematic shipyard in Finland, where the boats are made. Once more the Maxi Yacht Rolex Cup proved to be an enthralling spectacle. World class action and eye-catching racing craft in one of the most enticing locations on the planet. The Costa Smeralda provides a stunning setting and varied conditions for the THE MAXI YACHT ROLEX CUP, one of the highlights of the Mediterranean Yachting season. The first MAXI WORLD CHAMPIONSHIP was held in Sardinia 1980--the brainchild of YACHT CLUB COSTA SMERALDA and its President, THE AGA KHAN. This year's Regatta marks the 26th edition of the competition which comprises the 6th MAXI 72 ROLEX WORLD CHAMPIONSHIP. Inside Leonardo Ferragamo’s new Racing Yacht by Nautor’s Swan - WSJ: "Feel like the king of the world aboard Solleone, the latest seafaring masterpiece by Finnish yacht maker, Nautor’s Swan"
Ian Budgen on Leopard at finish of the 2015 Rolex Fastnet race - Published on Aug 19, 2015: Mike Slade's 100ft maxi Leopard finished the 46th Rolex Fastnet Race early Wednesday morning, after a slow but intense race. Light weather conditions is enjoyed by tactician Ian Budgen. A bit of fun with the Artemis offshore academy during Cowes Week! Clipper Round The World Yacht Race launches in London - BBC News: "... After travelling to Brazil, the yachts will go on to South Africa, then to Albany in Western Australia. From there, participants will sail to Queensland, and on to Vietnam and China. They will continue to Seattle and from there to New York via Panama. The final leg will see the yachts travel from New York back to London, where they are due at the end of July next year." Published on Aug 26, 2015: The Clipper Round the World Yacht Race preparations continued, as Unicef officially named its yacht in the Race Village. Twelve identical 70-foot stripped down ocean racers are preparing to battle it out over an eleven month global series which starts from London this Sunday (30 August 2015). It’s the world’s largest matched fleet and it will be taking on the longest ocean race around the planet at more than 40,000 nautical miles. The 2015-16 series is the tenth edition of the biennial Clipper Round the World Yacht Race. Multinational teams will take on the world’s toughest oceans in what has come to be regarded as one of the most challenging endurance events, with 14 races between six continents. Apart from the twelve seasoned professional skippers, the teams comprise mainly of amateur competitors, many of them novices prior to their extensive pre-race training. The ‘Corinthian’ spirit of the gruelling race has been made famous by its founder, the British yachting legend Sir Robin Knox-Johnston, who became the first person to sail solo, non-stop, around the world in 1968-9. Teams have been making final preparations this week in central London’s only marina at St Katharine Docks next to Tower Bridge, which will mark Sunday’s departure on this marathon event. Weather patterns are being studied and tactics developed against a busy backdrop of maintenance, stocking up on provisions for the first month-long race to Rio, mixed with naming ceremonies and farewell celebrations. Each team is around 60-strong, but there will only be a maximum of 24 per yacht at any one time, dropping to an average of 15 on some stages. Around ten to twelve crew will stay aboard for the full circumnavigation, the remainder joining for one or more of eight legs. The challenge for skippers is managing that changing dynamic while maximising competitive performance. Around 700 crew, representing 44 different nationalities, will participate in this edition, the biggest in the 19-year history of the event which started in 1996. This latest complement of competitors will bring the total number of new ocean racing sailors created by the Clipper Race to over 4,000 to mark its 20th anniversary next year when the fleet returns to London at the end of July. There was clear apprehension ahead of Sunday’s departure, with an adrenaline charged desire to get the racing started. The opening ceremony of the event had a Rio festival feel ahead of a parade on the Thames with Tower Bridge opening to salute the fleet as it headed out to the start line. Race 1 gets underway Monday, August 31, 2015, away from the busy river traffic with a start off Southend Pier at 1230 BST (1130 UTC). The race to Rio is filled with navigational and environmental challenges from the confines of the English Channel and the potentially rough conditions of the Bay of Biscay to the frustrations of the Doldrums where wind can disappear between northern and southern hemisphere weather systems ahead of the final push to the finish in Rio de Janeiro. Subsequent races take in South Africa, around Australia, including the infamous Boxing Day departure Sydney-Hobart race, Vietnam, China, USA coast-to-coast from Seattle to New York, Northern Ireland, Netherlands and back to London on 30 July 2016.